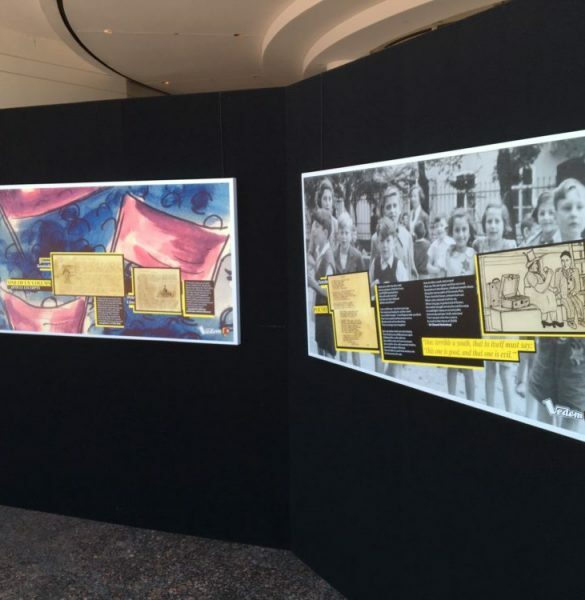 The temporary panel exhibit “Vedem: the Underground Magazine for the Terezin Ghetto” was on display at Hillel at Texas A&M from March 19, 2018 thru April 25, 2018. 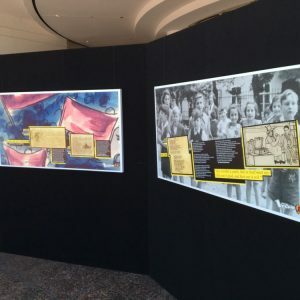 This was an art exhibit that deconstructed and reinterpretedthe literary work of the teenage Jewish creators of the longest-running underground magazine in a Nazi camp. Using a combination of pop-art graphics, archival photographs and cartoons, and the prose and poetry of teenage boy prisoners in Czechoslovakia’s Terezin Ghetto, VEDEM: THE UNDERGROUND MAGAZINE OF THE TEREZIN GHETTO breaks down the 83 weekly issues totaling the 800 pages of Vedem (“In The Lead” in Czech), then reconstructs them in the form of a contemporary magazine. The exhibit featured more than 200 linear feet of cartoons, illustrations, and editorial reproductions of the magazine’s content.